The adviser, George Papadopoulos, pleaded guilty to lying to the FBI and appears to be cooperating with the special counsel Robert Mueller’s investigation. 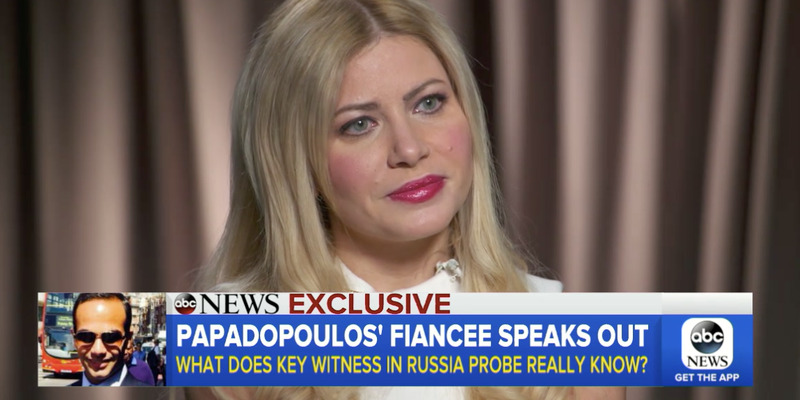 The fiancée, Simona Mangiante, named a previously unnamed professor with ties to the Russian government about whom Papadopoulos is believed to have lied to the FBI. Simona Mangiante, Papadopoulos’ fiancée, told ABC News that his job on the campaign was to “set up meetings with leaders all over the world” for senior campaign officials. Mangiante said Papadopoulos was “constantly in touch with high-level officials in the campaign.” She said she had seen correspondence proving it. Papadopoulos pleaded guilty to the charges, and the proceedings that followed his plea agreement indicate he is cooperating with the investigation into Russia’s election meddling and whether any Trump associates colluded with Russian officials. Mangiante’s other statements may set off red flags. “As I understand it, he lied about his contact – while he was with the campaign – with a professor with ties to the Russian government,” William Yeomans, a former deputy assistant attorney general who spent 26 years at the Justice Department, said when Papadopoulos pleaded guilty. The professor in question had not been identified in court filings, but Mangiante identified him to ABC as Joseph Mifsud, then the director of the London Academy of Diplomacy. The charges filed describe the professor as someone who could provide damaging information on Hillary Clinton, Trump’s 2016 rival. Mangiante said Papadopoulos was manipulated by Mifsud, who she said seemed strange to her. Misfud took an interest in Papadopoulos “precisely because he was working for Trump,” according to Mangiante. Mangiante said she decided to speak out to set the record straight against Trump administration officials who have said Papadopoulos had a minor role in the campaign.